Morocco is one of the richest and most diverse areas, in terms of collector specimens, on the Earth. Among the many deposits occurring in the country polymetallic hydrotemal veins are one of the rarest, and until recently have not produced any good quality mineral specimens. 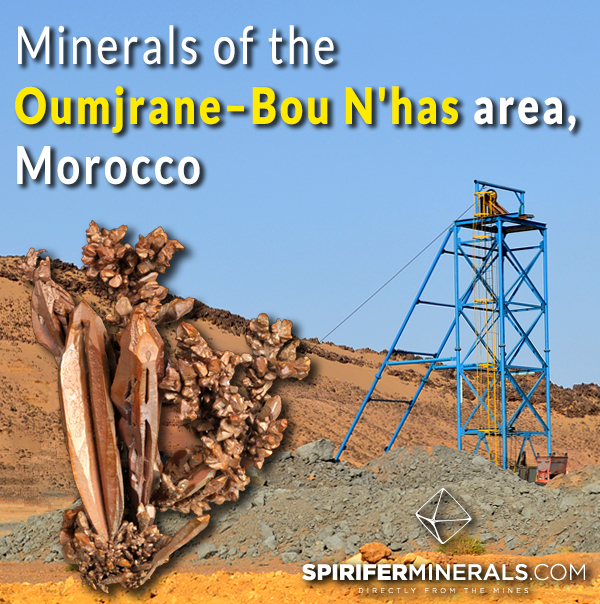 The Oumjrane – Bou N`has deposit, which re-opened at the end of 2011, is the first hydrothermal vein deposit to produce high quality mineral specimens. In addition to hypogene mineralization the deposit has well developed supergene and carbonate mineralization zones. 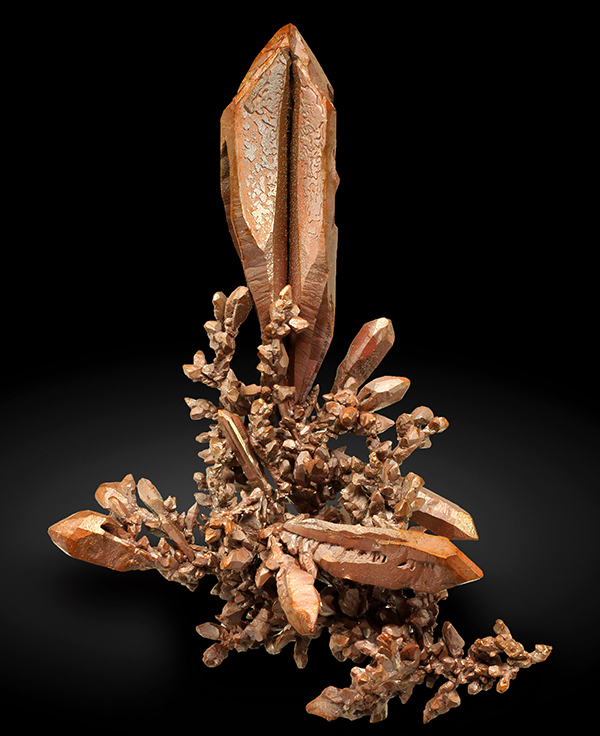 At the begging of 2015 a small zone with very well crystallize native copper specimens was discovered and produced the first high quality specimens of this species known from Morocco. Oumjrane village is a typical small Saharan desert settlement located in the Anti-Atlas mountains. The village is located in the western part of the mountains, 50 km south from the town of Alnif, 25 km west from Zagora, and 60 km North from Algerian border. 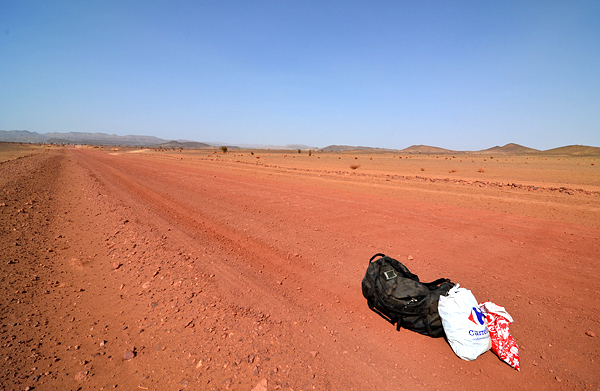 Because of bad road conditions reaching Oumjrane was previously difficult. Quite recently, a long stretch of the road from Alnif to Oumjrane was improved and now there are only 20 kms without an asphalt surface. 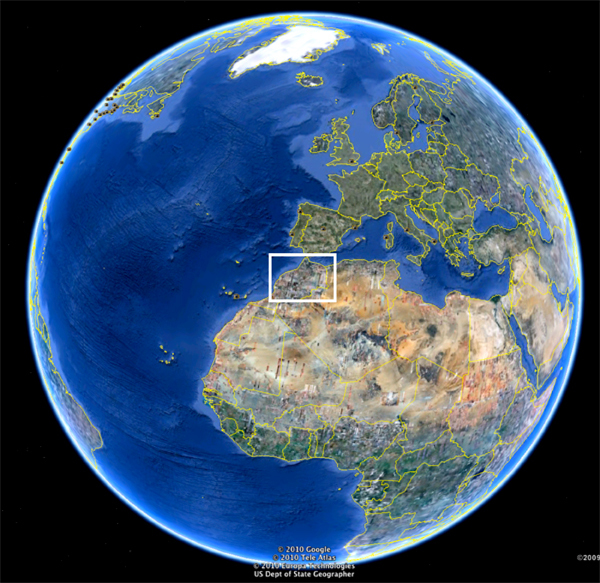 Satellite photo of Earth with marked area that is shown in the next figure. Map of Morocco with the Oumjrane area marked. Road to Oumjrane. Typical desertous landscape. J. Praszkier photo. 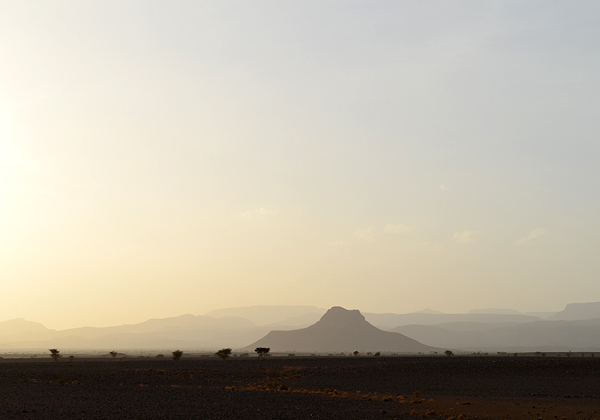 Landscapes in the Oumjrane area. J. Praszkier photo. 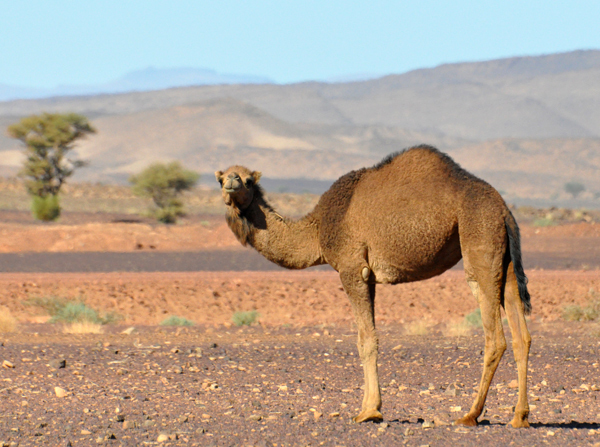 Camel, in the vicinity of Oumjrane. J. Praszkier photo. 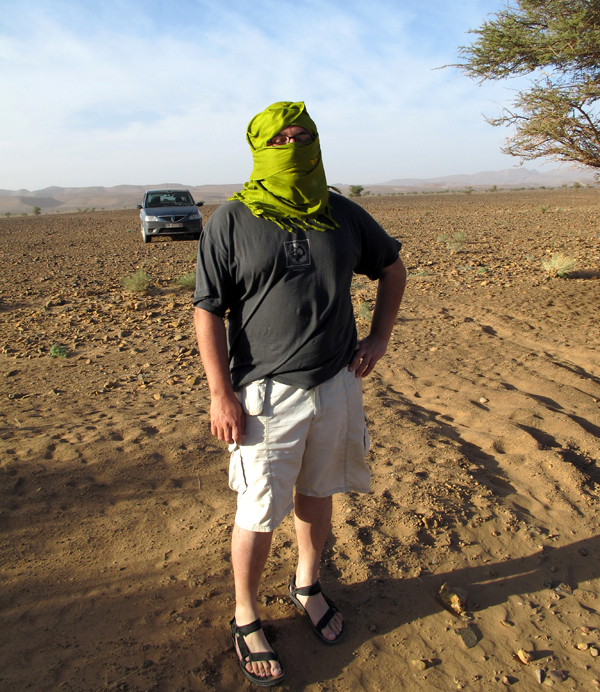 Tom in the desert. J. Praszkier photo. 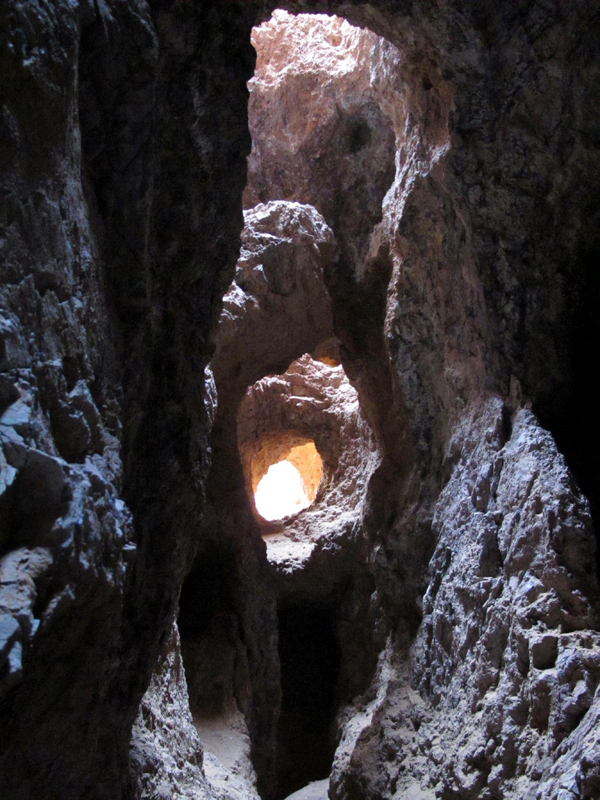 Before re-opening of the mines the area was essentially abandoned and was rarely visited by outsiders. 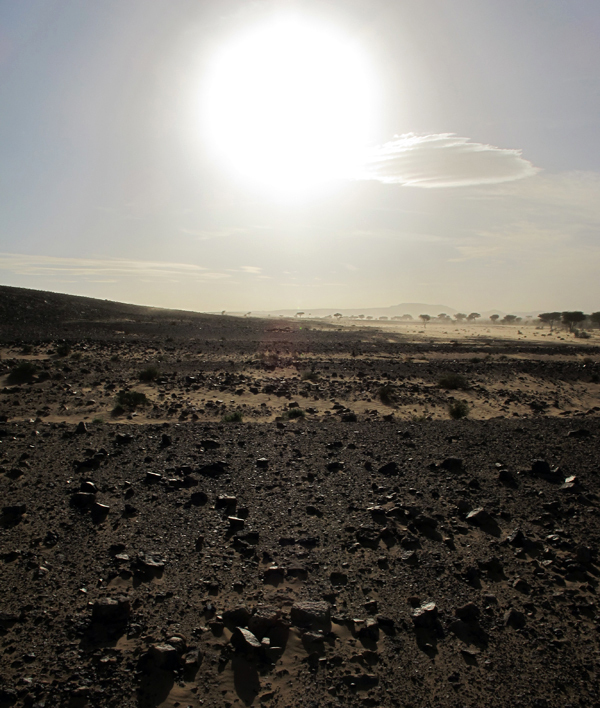 The landscape surrounding the village is typical hamada – stony desert with minor sand dunes. 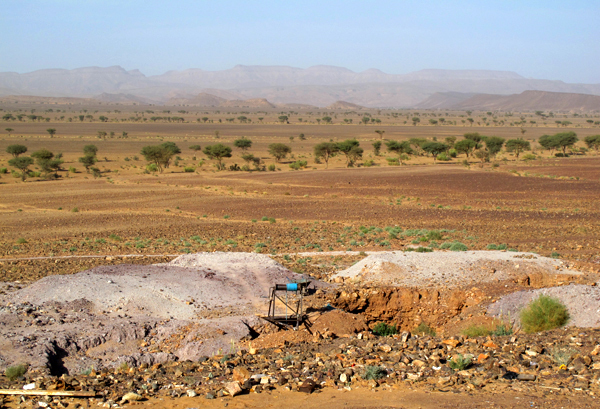 Bou N`has is the name of the desert region located a few kilometers north from the village, where the biggest polymetallic veins occur, and where the biggest mining activity is now. Bou N`has (Bou Nahas) literally means “there where the copper is”. 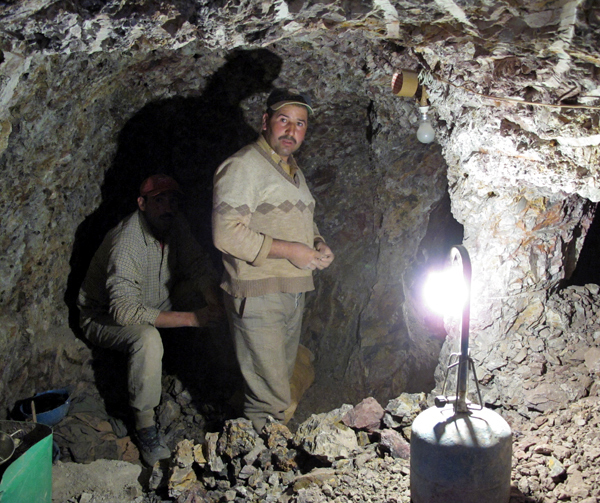 The proper name of the deposit and mining area is Oumjrane – Bou N`has as the deposit is found between those two areas. 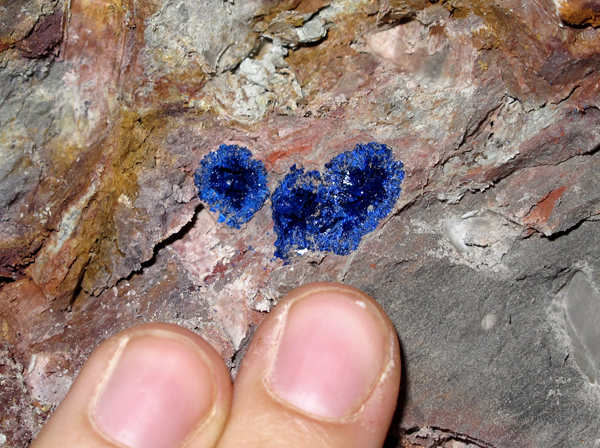 There are two other important azurite localities in close vicinity to Oumjrane, both are connected to the same mineralization (described below). One, also known as Oumjrane, is located 1 km south of the village. From 2000-2010 locals were digging azurite crystals on matrix from old French workings at this deposit. The other location is roughly 15 km North, close to the village of El Fetcht. Map of the Oumjrane area. Note the Bou N`has mining center and shafts (described below). Old mining buildings and quarries, Bou N`has deposit, photo taken in 2008. The same place in 2014, changed already into a mining center. J. Praszkier photo. One of the shafts with the dumps. J. Praszkier photo. One of the Boun N`has shafts. J. Praszkier photo. Baryte vein at the dump of Bou N`has mine. J. Praszkier photo. Map of the Oumjrane area. Note the Oumjrane old azurite workings (described below). Remains of the exploatation by the French in the 1960s. J. Praszkier photo. Partly preserved underground workings of the old mine. J. Praszkier photo. 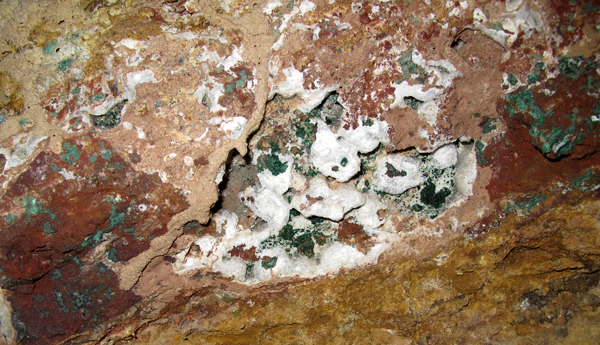 Malachite and aragonite in the wall of Oumjrane old azurite workings tunnel. Map of the Oumjrane area. Note El Fecht azurite workings (described below). View from the El Fecht workings. J. Praszkier photo. View to the El Fecht workings. J. Praszkier photo. El Fecht workings. J. Praszkier photo. Tom in El fecht workings. They go deeply underground. J. Praszkier photo. A maze of underground workings in El Fecht. J. Praszkier photo. Underground in El Fecht with the miners. J. Praszkier photo. Miners in El Fecht workings. J. Praszkier photo. 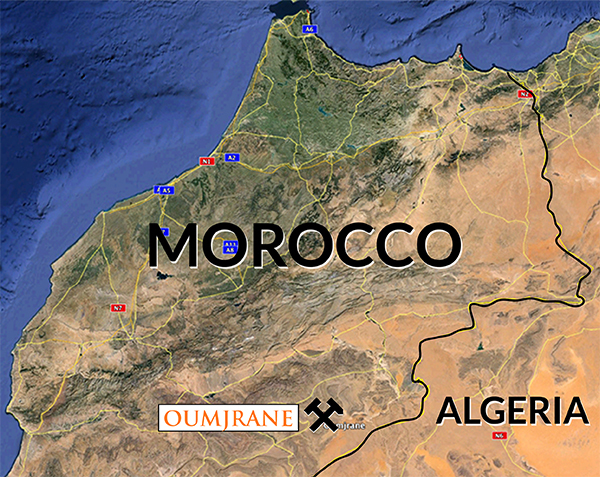 Copper deposits in the Oumjrane area were exploited in the Middle Ages and maybe even before. After that several mining operations were made during French colonial times, mostly in the early seventies. The most extensive exploitation took place in Bou N`has but also South of Oumjrane (now abandoned). 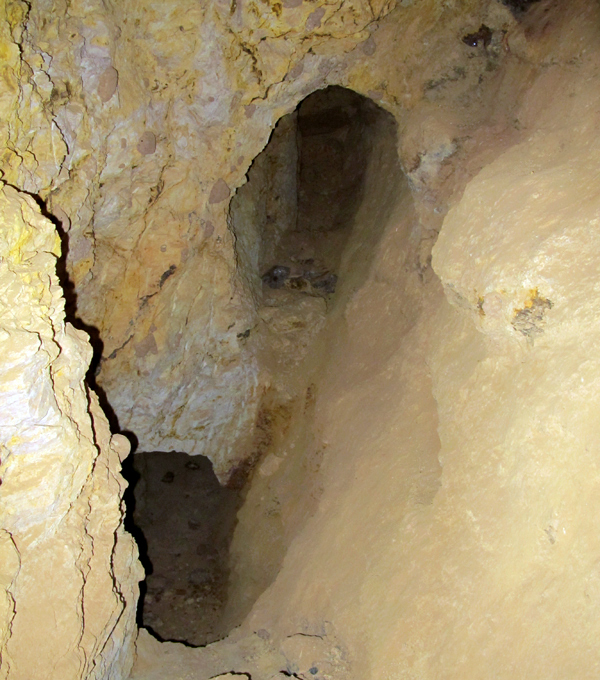 Ore was mined in quarries and shafts. It was then transported to a distant floatation plant located in Bou Skour. In the mid-70s, when the French left Morocco, all mining operations were stopped and abandoned. 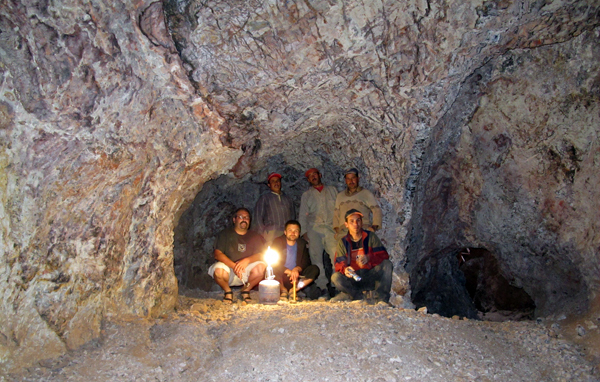 In 2011, after several years of research, ONA Company re-started mining activity in the area. Over 3 years several small shafts were opened, a mining center was created and a floatation plant is under construction. Depth of the shafts reaches 120 m, and about 500 miners are working there recently. Mining is still in the “starting” phase and in the near future we can expect expanded operations in the area. The Anti-Atlas Mountains in the Oumjrane area are built mostly by Upper Ordovician marls, shales, sandstones and conglomerates. 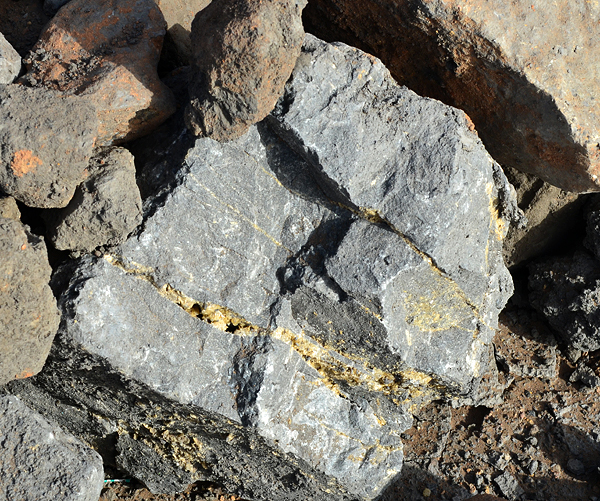 Mineralization hosted in these rocks is typical polymetallic hydrotermal veining developed along faults and fractures. The age of mineralization is probably post-Variscan and hydrothermal activity is connected with late Triassic volcanism. Veins are very steeply dipping, in some places almost vertical. Hypogene mineralization in the main ore veins occurred in three stages. 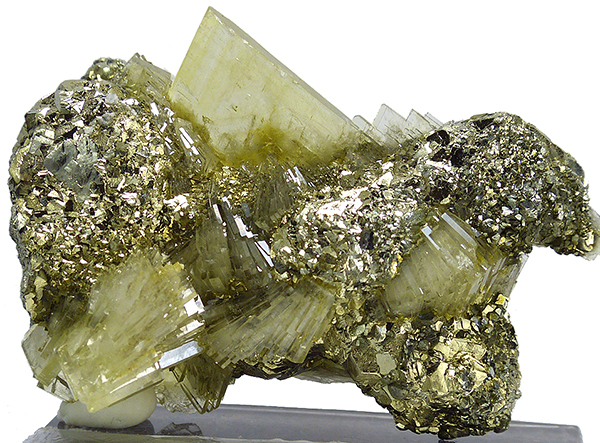 The first stage is built mostly by pyrite; second – and the most important from an industrial point of view – is dominated by chalcopyrite, and the third by galena and baryte. The last stage of development of the deposit was formation of much younger secondary mineralization. It is found as two major types of mineralization connected with supergene alteration – a supergene enrichment zone and an oxidation zone. Native coppers are result of the reduction processes in supergene alteration. 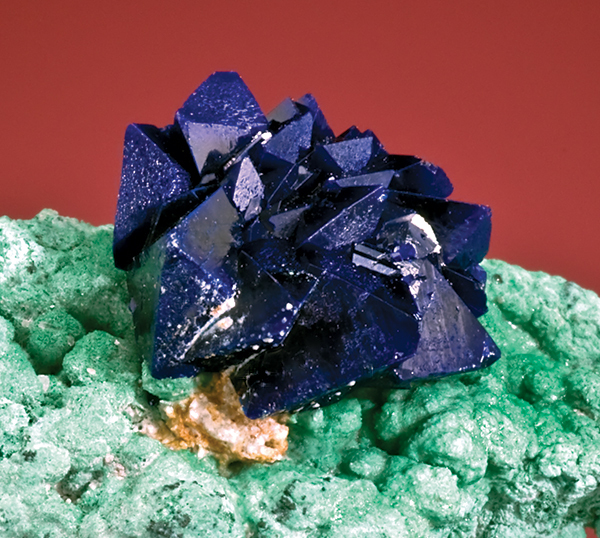 Mineralogy of the oxidized zone is dominated by malachite and azurite. The age of the secondary mineralization is not exactly known, but most it probably formed between the Jurassic and Neogene. From the latter part of 2011 there has been a constant flow of the specimens from this area, mostly low quality. However, several interesting finds were made during that period and many good quality collectors specimens were recovered. The most important of them are described below. 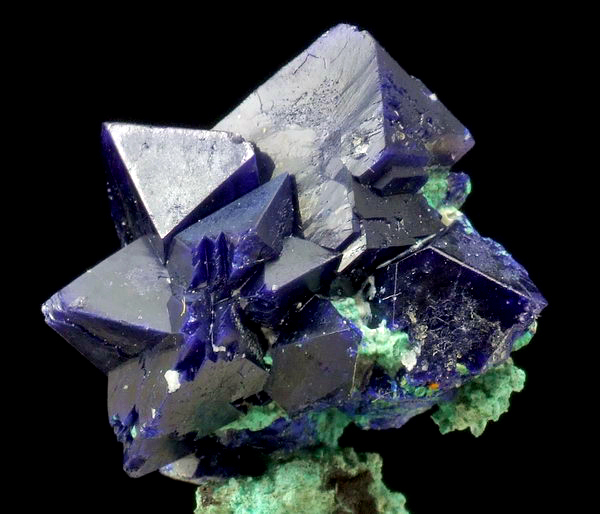 Much better quality azurite specimens were collected from nearby workings, such as old post-French mines located 1 km south of the village. Most specimens from here are nicely separated single crystals on matrix. 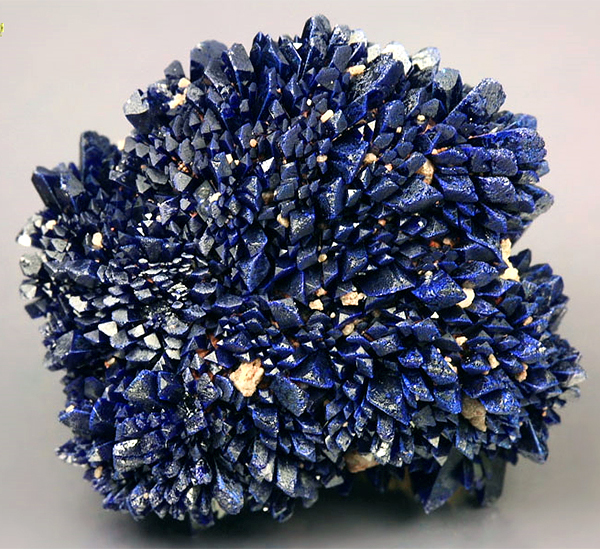 The best specimens contained well-formed short, discoidal, azurite crystals forming “flower-like” aggregates. The color and luster of some of these is very good. Recently there is no collecting activity at these workings. 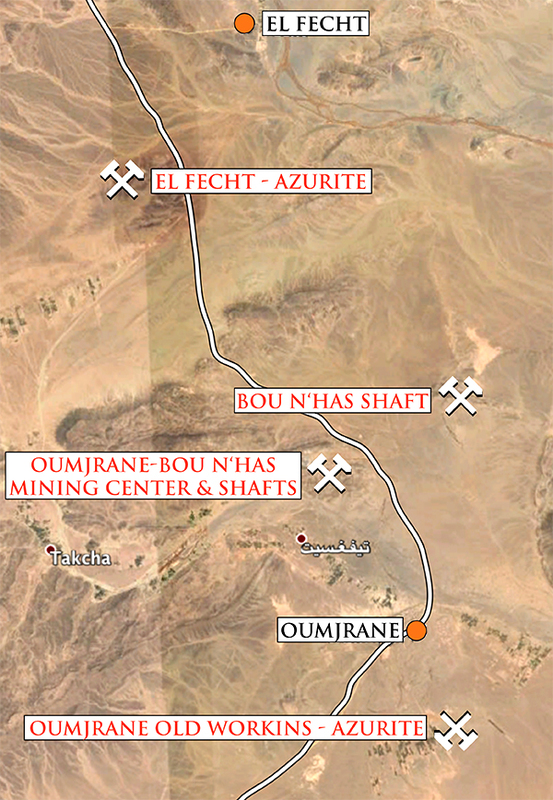 A second azurite occurrence is located about 15 km NW from Oumjrane, near El Fecht. In extensive underground workings miners are digging for flat “sun-shape” azurite clusters occurring in marls. The vast majority of specimens are low quality, sold as wholesale material. Rarely in some zones there are concentrations of the better quality specimens, still in the same shape, but bigger (reaching 10 cm) with big crystals on the edges. The color of the azurite from El Fecht is usually dark, and luster is reasonable. 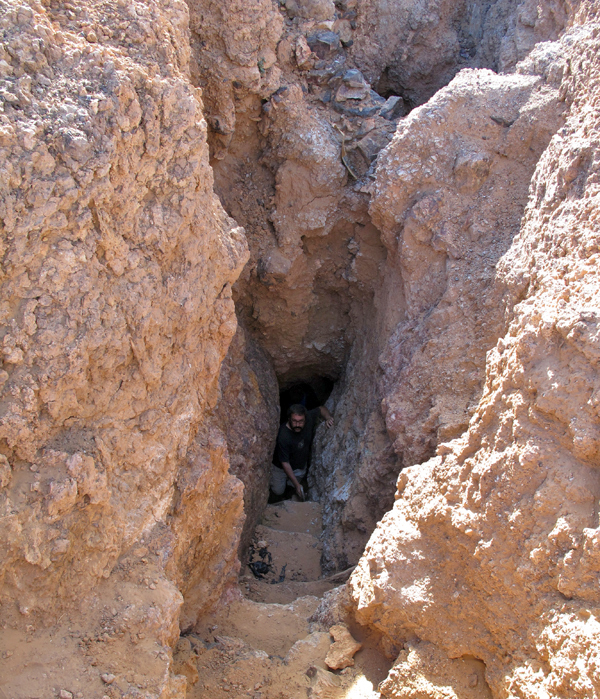 in Oumjrane old azurite workings. Spirifer specimen. J. Scovil photo. in Oumjrane old azurite workings. 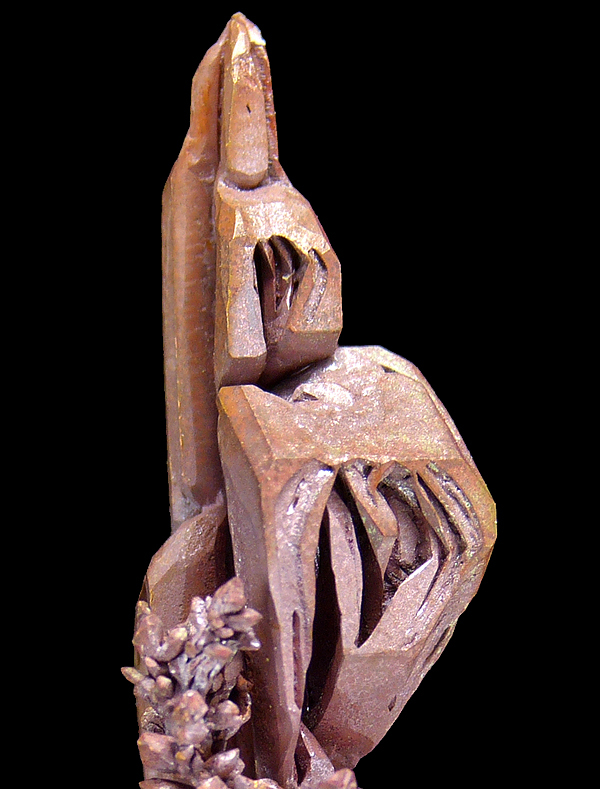 Spirifer Specimen. G. Bijak photo. 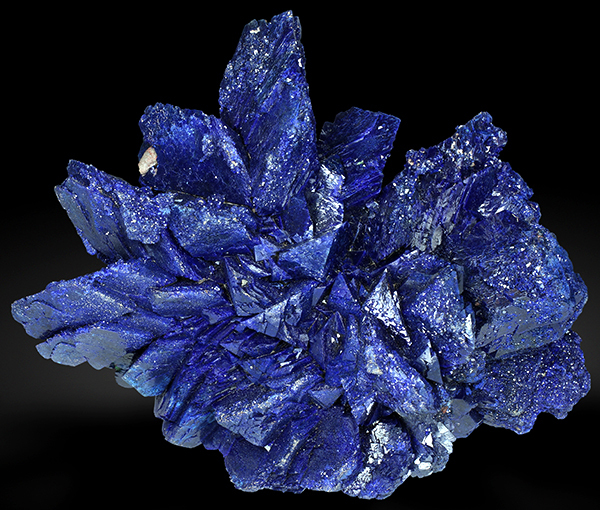 Single sharp crystal of azurite, size 2.3 cm, collected in 2010 in Oumjrane old azurite workings. Spirifer specimen. J. Scovil photo. 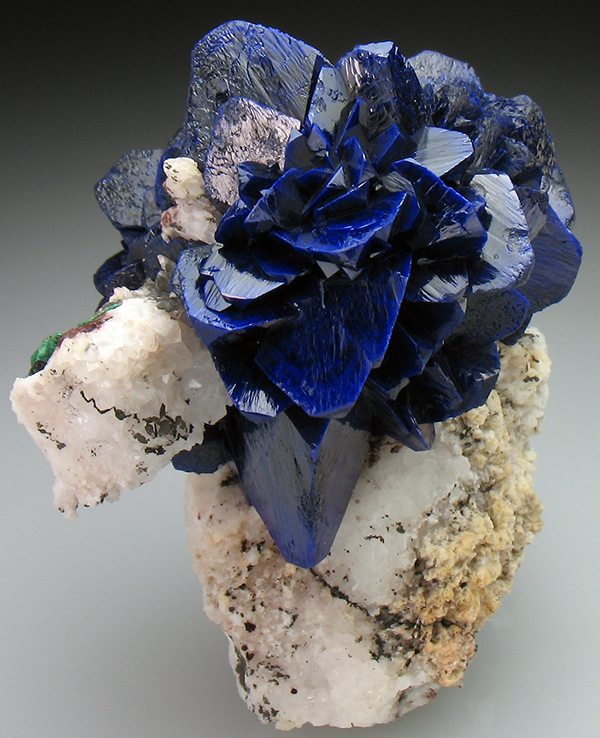 One of the best known examples of azurite from Oumjrane old azurite workings, size 5 cm. Crystal Classics specimen and photo. Azurite in situ in El Fecht workings. J. Praszkier photo. Azurite from El fecht, size 2.3 cm. 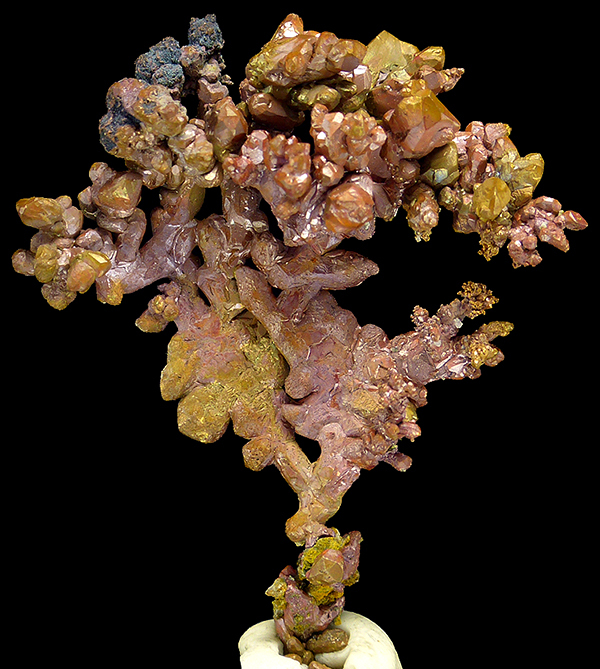 Quebul Fine Minerals specimen and photo. Azurite from El Fecht, size approx. 3 cm. R. Bode specimen and photo. Azurite from El Fecht, size approx. 7 cm. R. Bode specimen and photo. Azurite from El Fecht, size 6 cm. E. Llorens specimen. J. Callen photo. Azurite from El Fecht, size approx. 6 cm. R. Bode specimen and photo. 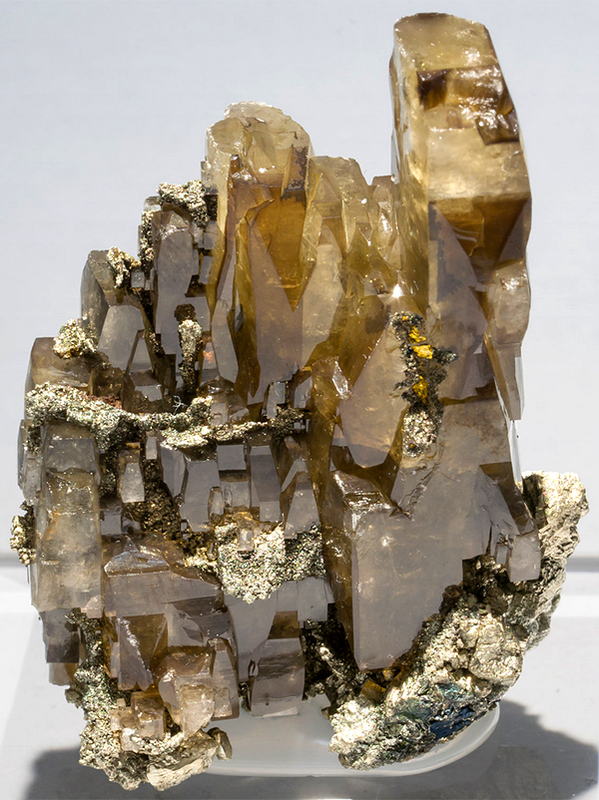 Baryte is one of the most common minerals occurring in Bou N`has area. 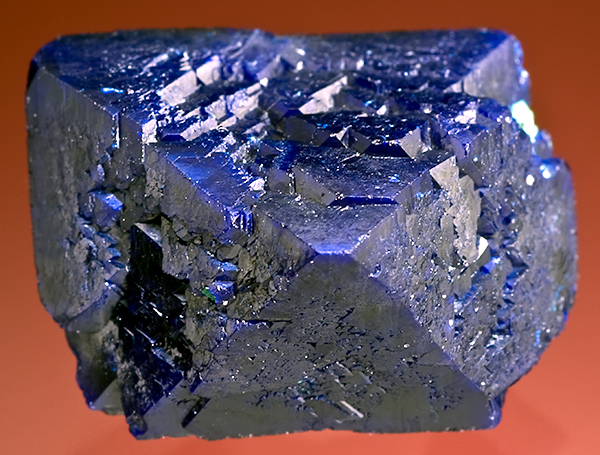 It is found in two main habits; the most common is sharp, tabular crystals with great luster. The color is usually grey through brown to canary-yellow, frequently with color zonation (phantoms), are known. 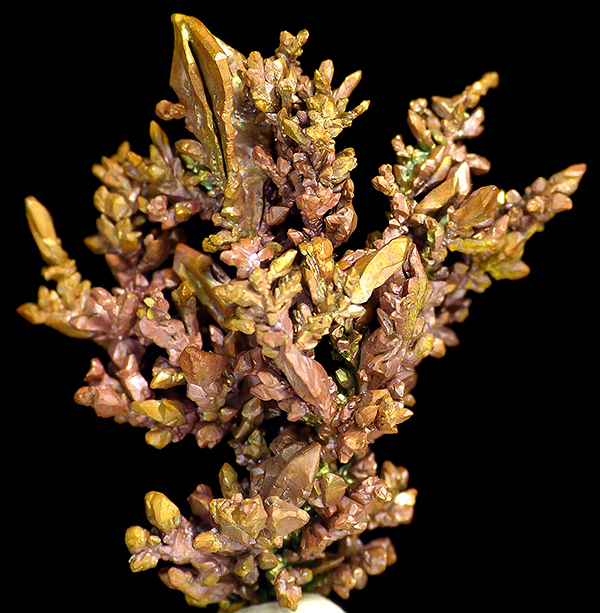 Crystals of this habit are usually found in aggregates of parallel growth and are multi-terminated, but still very sharp. The size of this type of crystals is usually around 4-6 cm but sometimes they reach even 10 cm. The second habit is rosettes formed by thin tabular crystals. 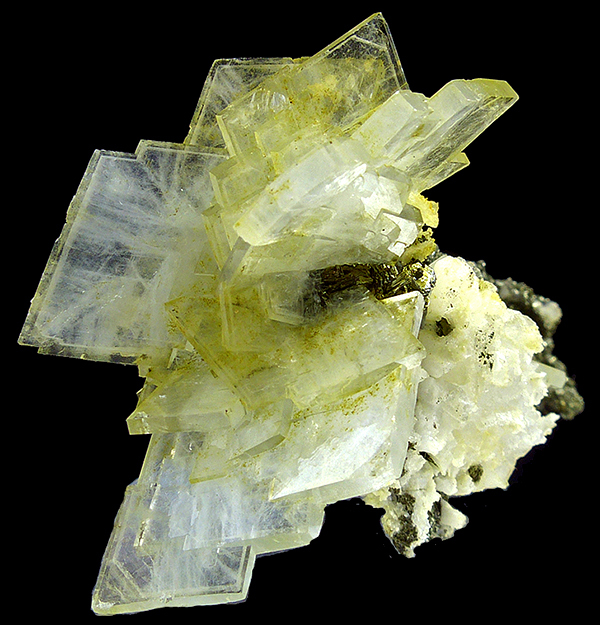 Usually baryte in of habit has better luster, but crystals are smaller, and it usually occurs on quartz matrix. The color is almost always white, and the rosettes are typically around 2-6 cm, but in some extreme situations even up to 25 cm! 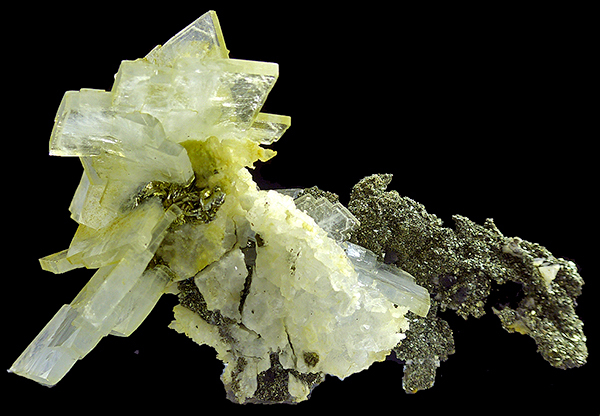 Both baryte habits are commonly associated with quartz, pyrite and marcasite. In 2013 a zone with unusual pyrite masses forming sharp casts after tabular baryte crystals, which were completely dissolved, was found. Doubly terminated tabular baryte crystal with quartz inclusions, size 7 cm, collected in 2014-2015 in Bou N`has mine. Spirifer specimen. J. Praszkier photo. in Bou N`has mine. Spirifer specimen. M. Wikiera photo. Baryte crystals with marcasite, size 5.3 cm, collected in 2014-2015 in Bou N`has mine. Spirifer specimen. M. Wikiera photo. collected in 2014-2015 in Bou N`has mine. Spirifer specimen. M. Wikiera photo. The same specimen from the picture above. M. Wikiera photo. Thick tabular baryte crystals on matrix, collected in 2012 in Bou N`has mine. Spirifer specimen. G. Sobieszek photo. Thick tabular baryte crystals with marcasite on quartz, collected in 2012 in Bou N`has mine. Spirifer specimen. G. Sobieszek photo. 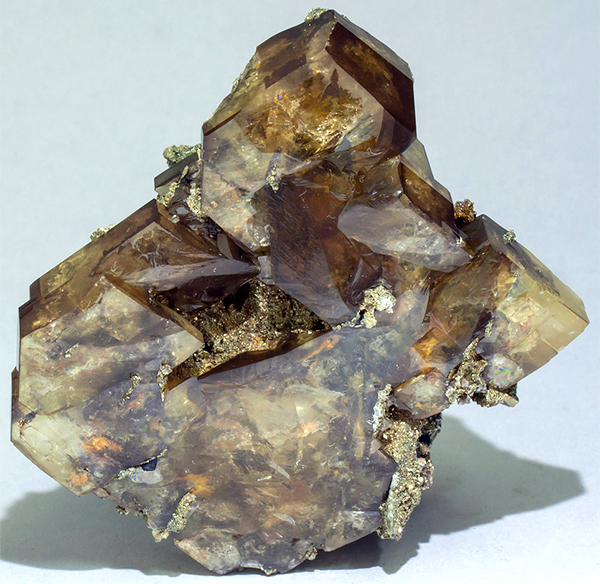 Brownish-yellow thick, tabular, glossy baryte, size 7 cm, found in 2014 in Bou N`has mine. 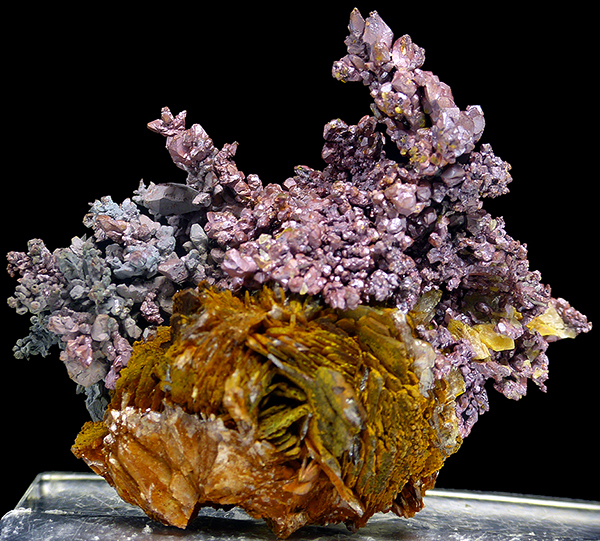 Fabre Minerals specimen and photo. 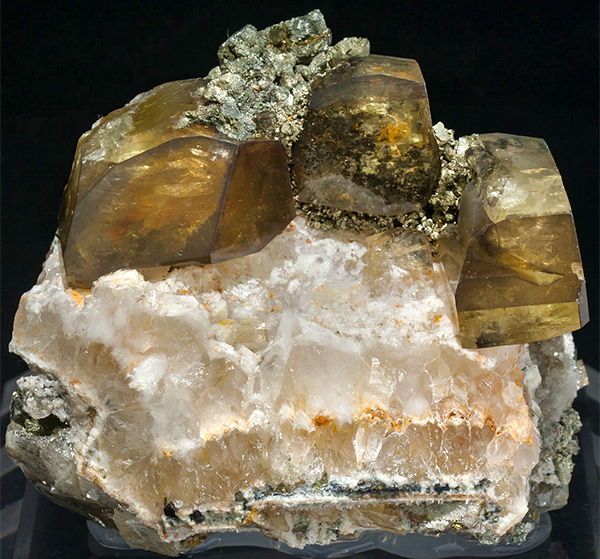 Brownish-yellow thick, tabular, glossy baryte, size 6 cm, found in 2014 in Bou N`has mine. 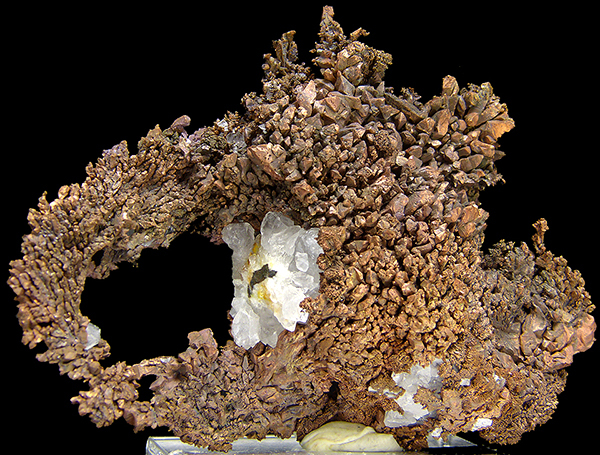 Fabre Minerals specimen and photo. in Bou N`has mine. 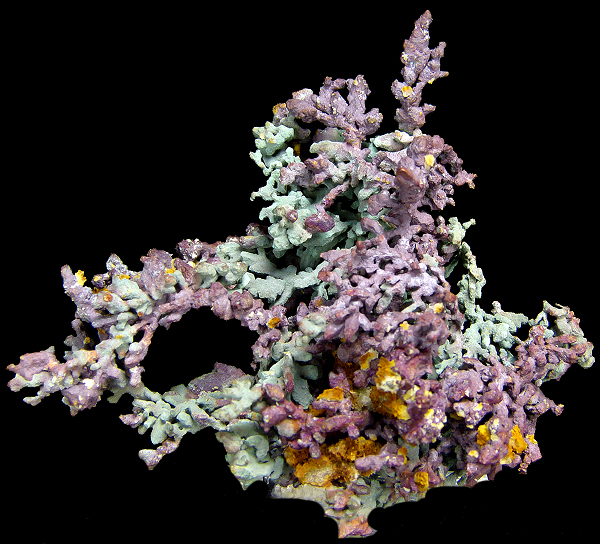 Fabre Minerals specimen and photo. 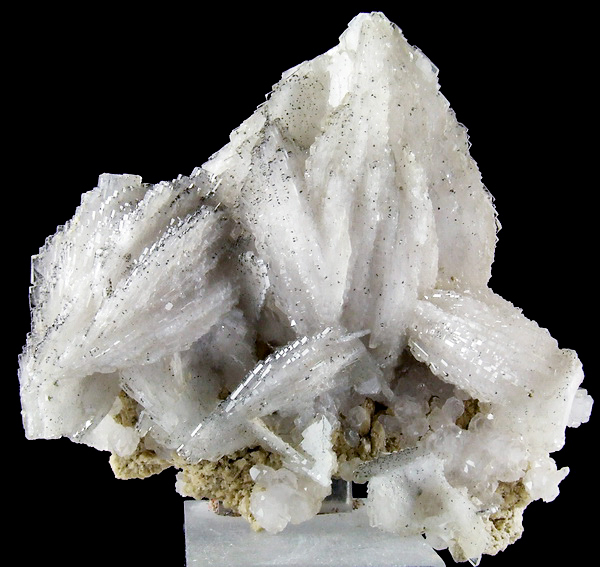 Well formed gemmy baryte crystals on quartz, size 5 cm, collected in Bou N`has in 2014. 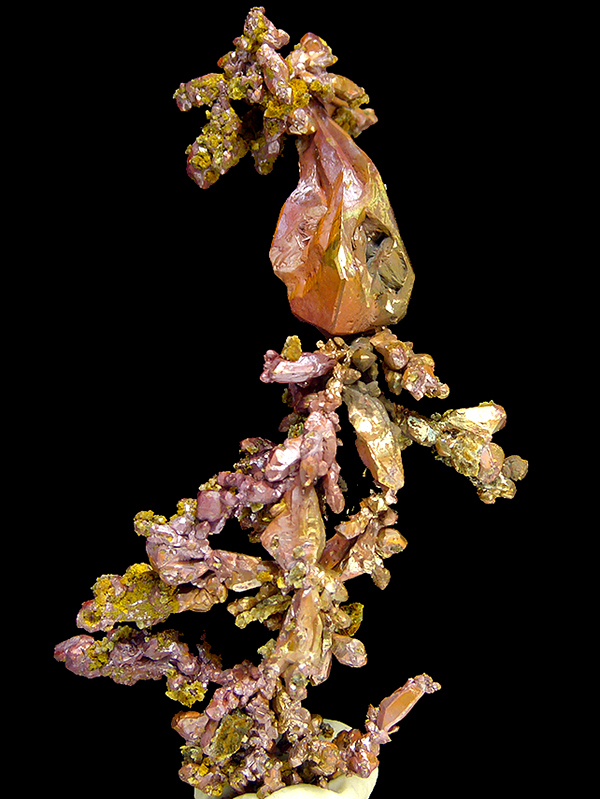 Fabre Minerals specimen and photo. White rosettes of baryte, size 8cm, collected in 2011 in Bou N`has mine. Spirifer specimen. G. Bijak photo. Movie of the specimen pictured in the photo above. 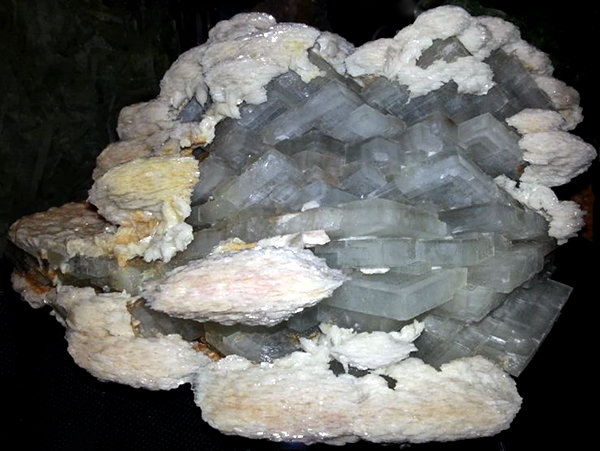 Baryte rossettes, size approx. 7 cm, collected in 2014-2015 in Bou N`has mine. 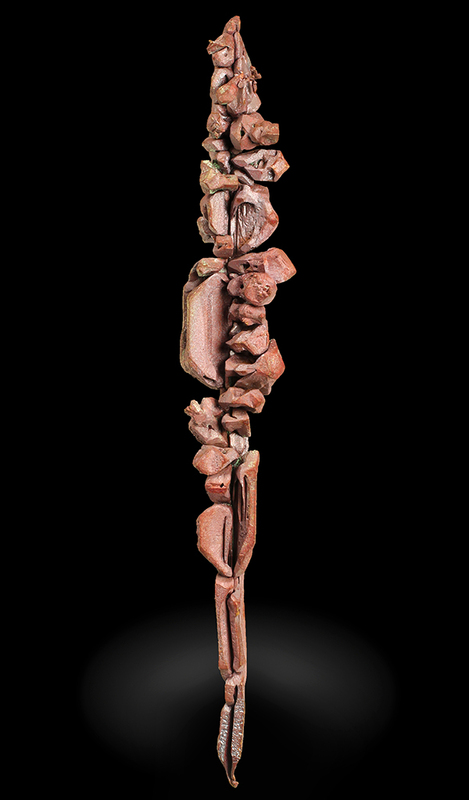 Spirifer specimen. J. Praszkier photo. Backside of the specimen pictured above. It is re-healed and re-crystallized. Monstrous two-generation rosette of baryte, size 23 cm (!) from Bou N`has. 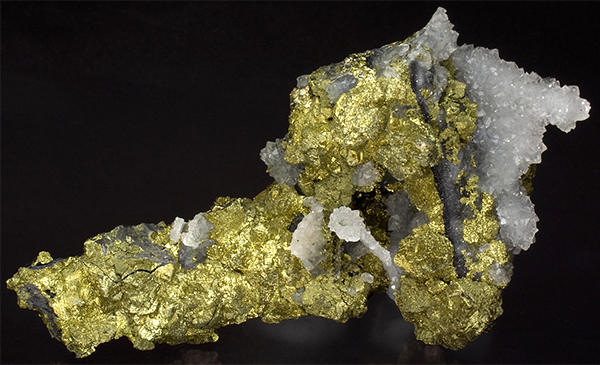 Chalcopyrite is the main ore mineral mined in the area. Surprisingly it occurs quite rarely in well crystalline form. 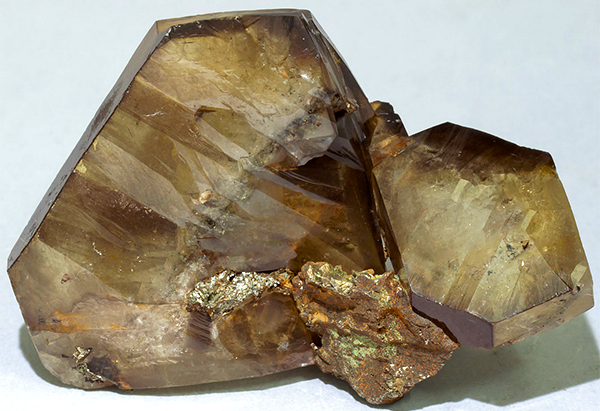 When it is found as well developed crystals it has classic golden color and crystals are simple tetrahedrons. Such crystals usually do not reach more than 1 cm. 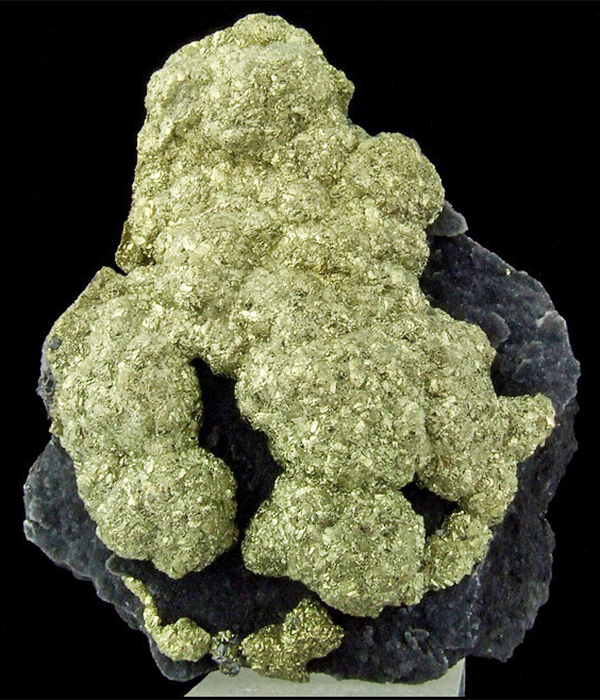 Another habit is botryoidal or globular masses that are built by small (1 mm) chalcopyrite crystals. Good chalcopyrite specimens were collected mostly in early days of mining operations, and recently they are rarely found. Chalcopyrite on quartz, size 13 cm, collected in 2011-2012 in Bou N`has mine. 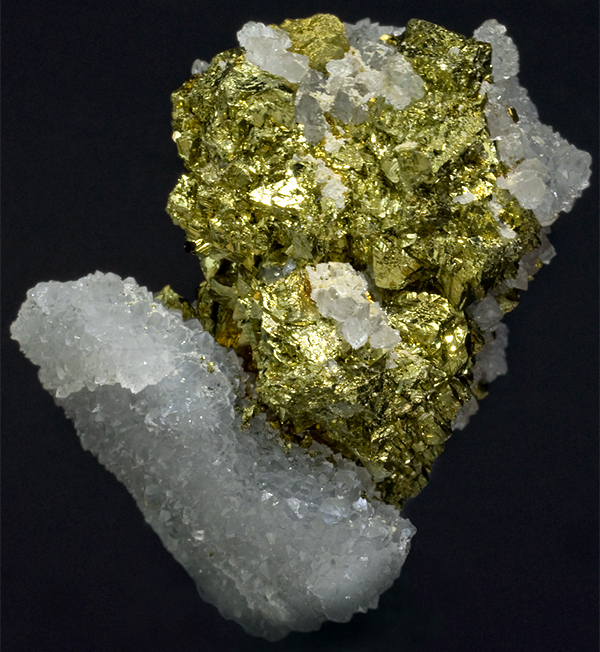 Fabre Minerals specimen and photo. Crystalline chalcopyrite on quartz, size 6 cm, collected in 2011-2012 in Bou N`has mine. 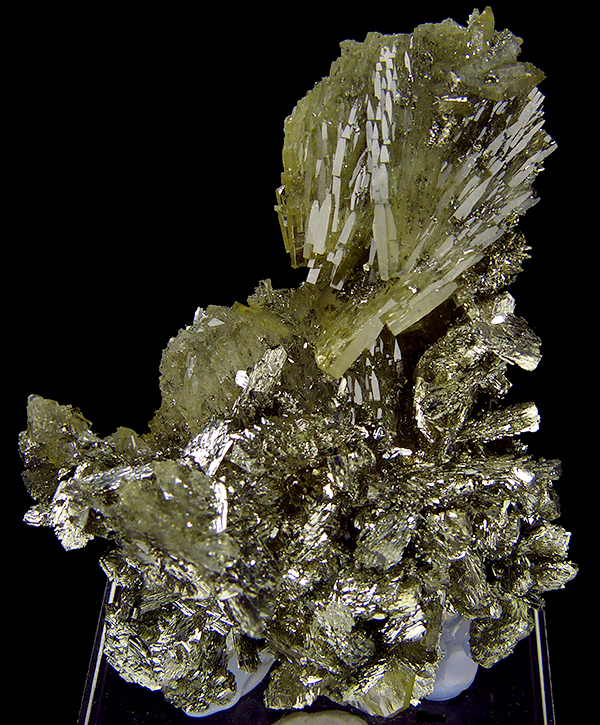 Fabre Minerals specimen and photo. Spheroidal aggregates of chalcopyrite, size 11 cm, found in 2011 in Bou N`has mine. 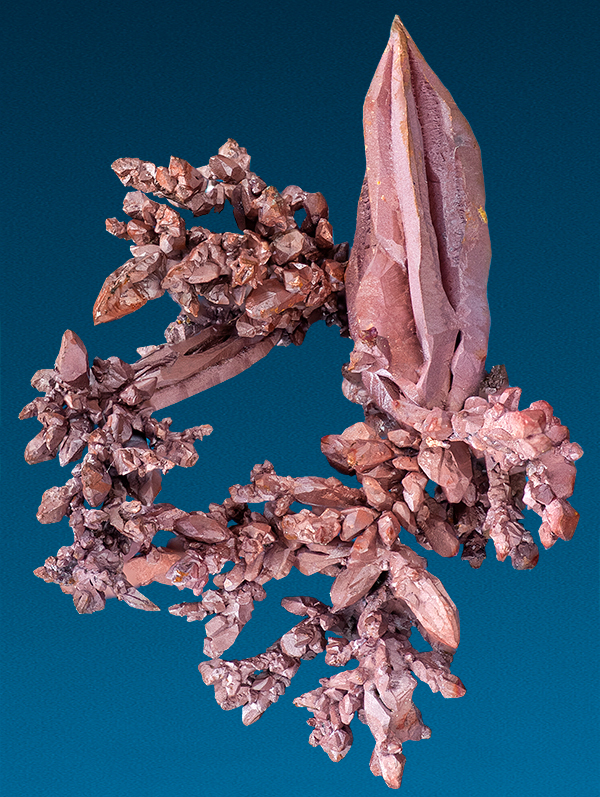 Until early 2015 native copper was known only as arborescent-spongy aggregates without well-formed crystals. Some of these are quite big, but are highly oxidized and covered by malachite. At the begging of 2015 a small zone filled by green clay with many floaters of crystalline copper was discovered. Miners collected around 1000 specimens from the clay. Most of them were low quality, but about 100 contained very well formed, sharp crystals. The majority of the good quality specimens were rather small – reaching up to 5 cm, but a few are up to 10 cm. Also, several loose elongated spinel law twin crystals were recovered, some reaching up to 7 cm. The biggest and most spectacular crystals are formed as sharp, skeletal elongate spinel law twins similar to those known from Rubtsovskoe in Russia and Itauz in Kazakhstan. The degree of skeletal growth varies on the specimens, from very slight to very strong development of crystal edges. The most extreme skeletal growth is present on single crystal floaters of the biggest super-elongated twins. 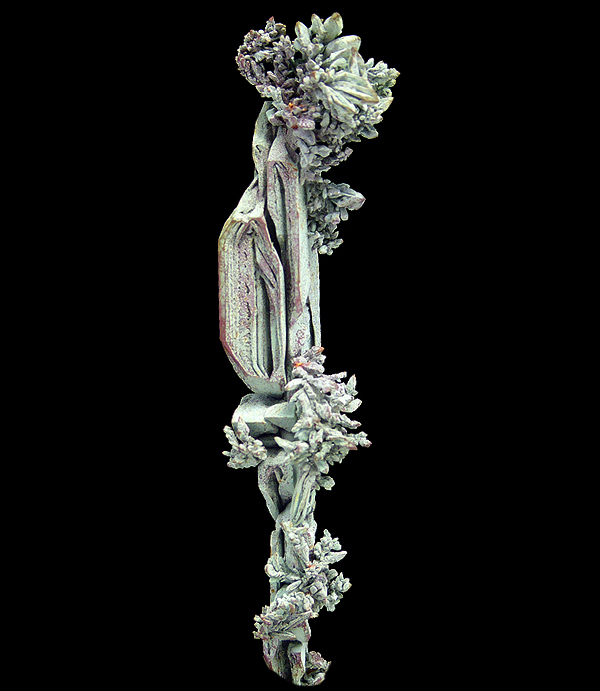 They are also the biggest of all crystal morphologies, reaching up to 7 cm (usually 2-4 cm). On a few specimens spinel law twins were noted with very minor skeletal growth. In addition to the bigger, very elongate, twinned crystals there are also smaller untwined crystals that are usually more equant and distorted. It is difficult to identify the specific crystallographic forms in those crystals. The size of the biggest untwined crystals is no more than 1 cm. 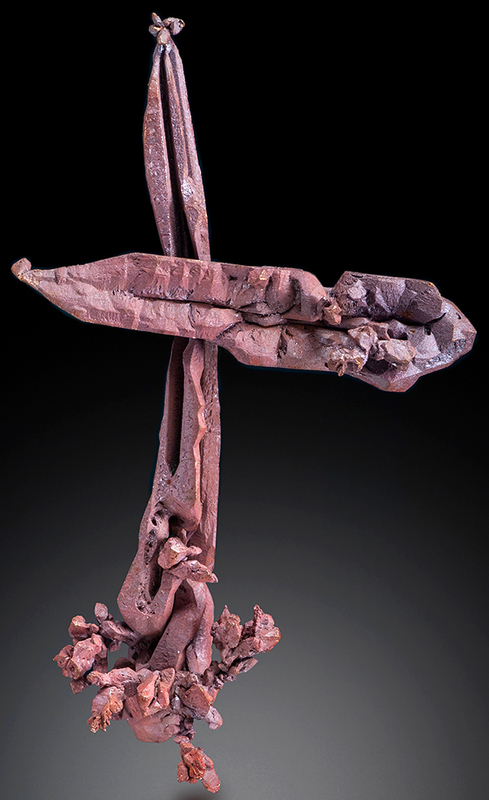 There are four kinds of surfaces on copper specimens from the find. The rarest are clean, lustrous copper colored surfaces. Also quite rare, but the most spectacular are very colorful surfaces that are coated probably by very thin film of Cu and or Fe oxides. Third, are more or less red coatings, created by microcrystalline cuprite. Fourth are green malachite coatings. Malachite and cuprite coatings are the most common. Usually clean copper is found in association with iridescent coatings. Cuprite and malachite coated surfaces also occur together. 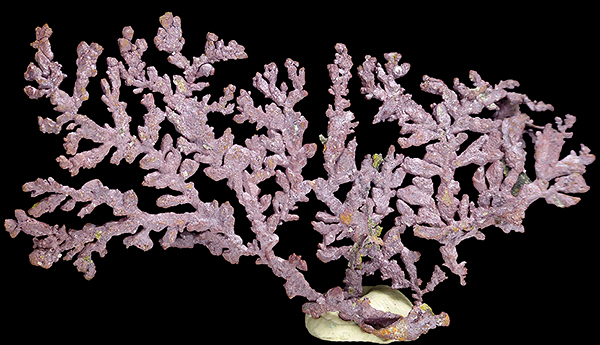 This combination of coatings makes many specimens very colorful. The clay zone where these specimens were discovered was relatively small and was completely exploited by miners. Thus far, similar zones have not been discovered. found in 2014 in Bou N`has mine. Spirifer specimen. M. Wikiera photo. 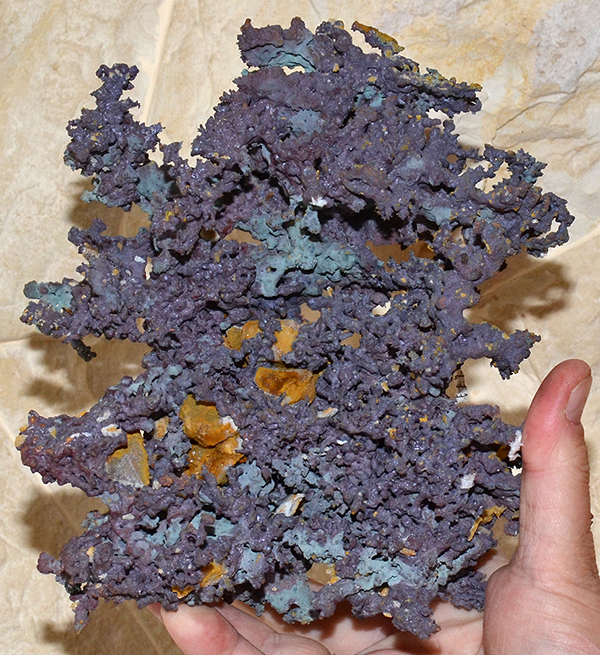 Arborescent copper coated partly by malachite (green) and partly by cuprite (reddish), size approx. 17 cm, found in 2015 in Bou N`has mine. Spirifer specimen. J. Praszkier photo. Arborescent copper coated partly by malachite (green) and partly by cuprite (reddish), size approx. 23 cm, found in 2015 in Bou N`has mine. Spirifer specimen. J. Praszkier photo. Huge arborescent copper coated partly by malachite (green) and partly by cuprite (reddish), size approx. 30 cm, found in 2015 in Bou N`has mine. Spirifer specimen. J. Praszkier photo. size 7.5 cm, found in 2015 in Bou N`has mine. Spirifer specimen. M. Wikiera photo. Example of the new for the area, well-crystallized coppers, found in one small pocket. 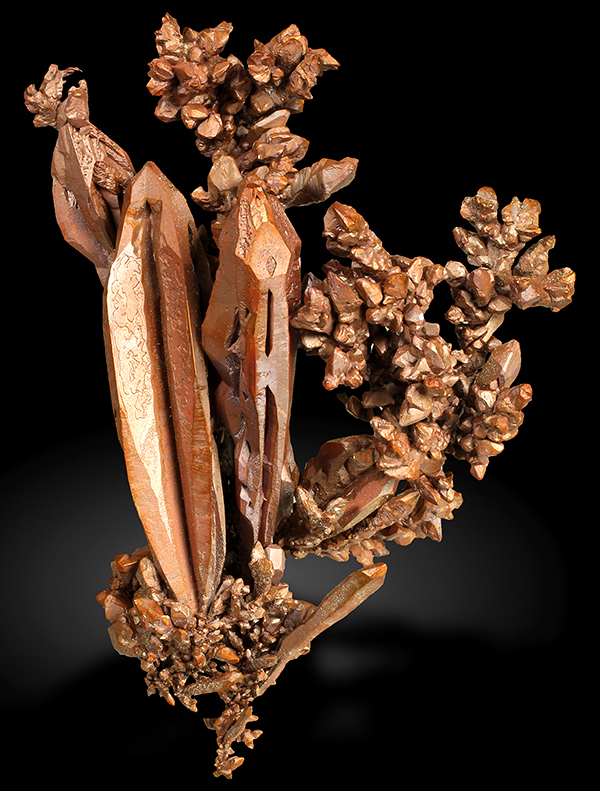 Here, copper with quartz, size approx. 7 cm, found in 2015 in Bou N`has mine. Spirifer specimen. M. Wikiera photo. 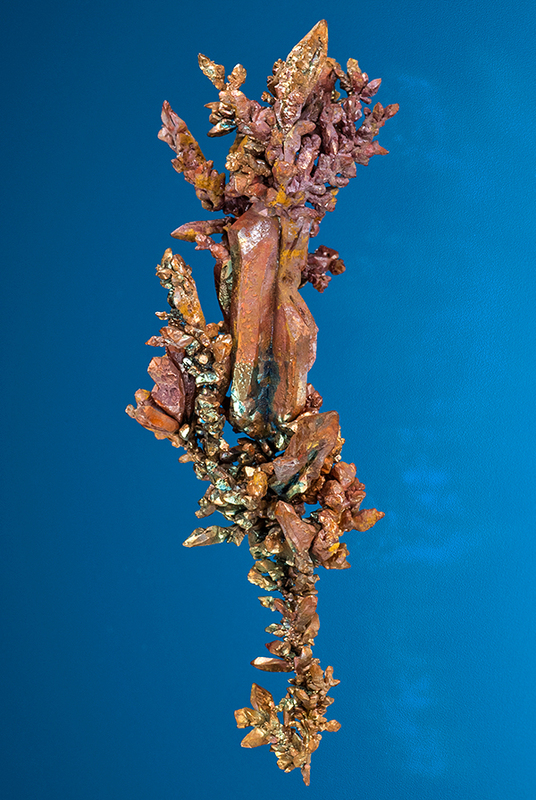 Well-crystallized copper, size approx. 7 cm, found in 2015 in Bou N`has mine. Well-crystallized coppers, main crystal approx. 3 cm, collected 2015 in Bou Nhas. 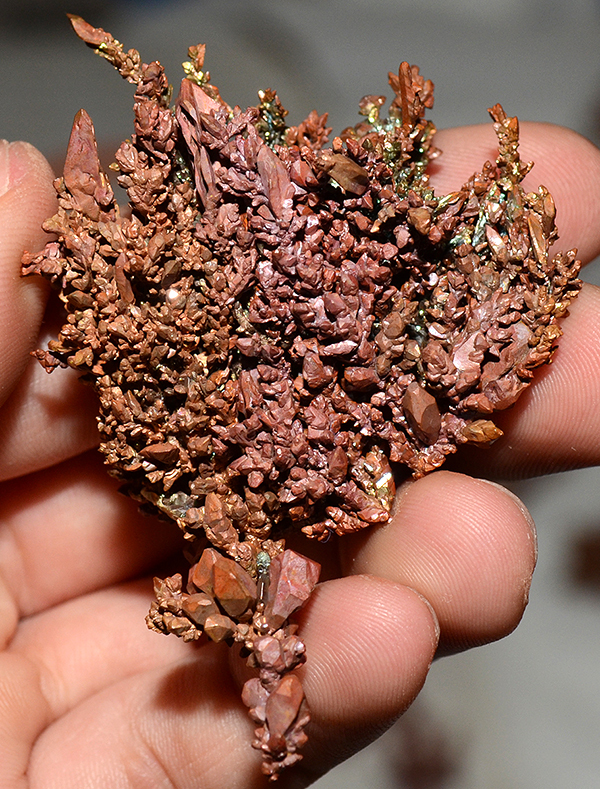 Crystalline copper, size 6.5 cm, found in 2015 in Bou N`has mine. Spirifer specimen. 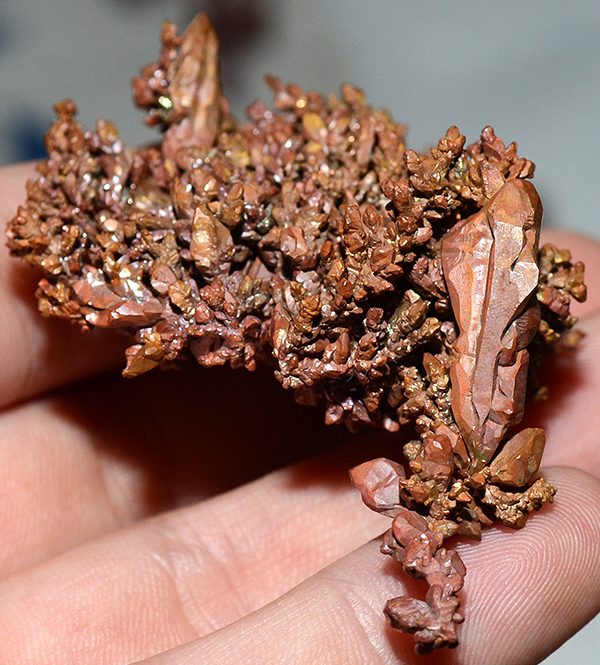 Crystallized copper, size 6.5 cm, found in 2015 in Bou N`has mine. Spirifer specimen. in Bou N`has mine. Spirifer specimen. J. Scovil photo. 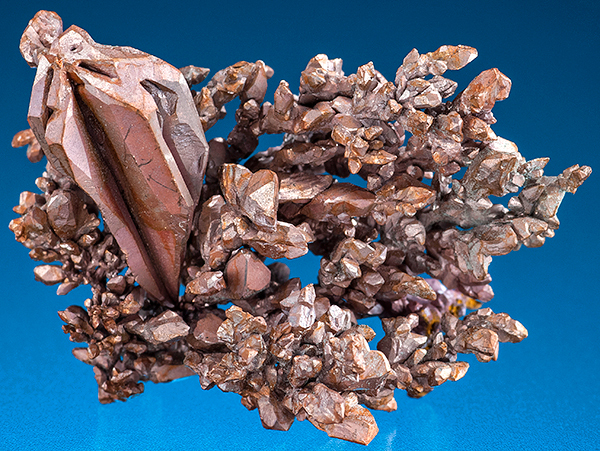 One of very few specimens of crystalline copper on matrix collected from the pocket. Here on baryte, size approx. 3.5 cm, found in 2015 in Bou N`has mine. Spirifer specimen. M. Wikiera photo. found in 2015 in Bou N`has mine. Spirifer specimen. J. Scovil photo. in Bou N`has mine. Spirifer specimen. J. Callen photo. 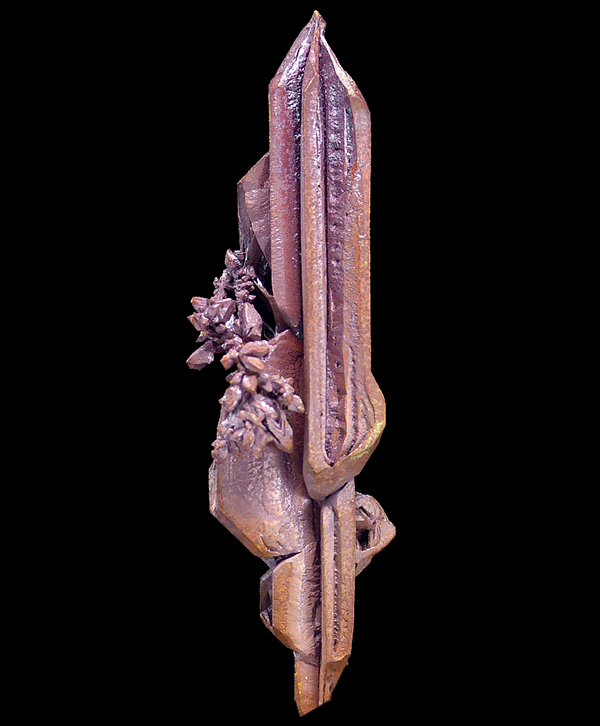 Copper with elongated spinel law twin, size 3.5 cm, found in 2015 in Bou N`has mine. Spirifer specimen. J. Callen photo. 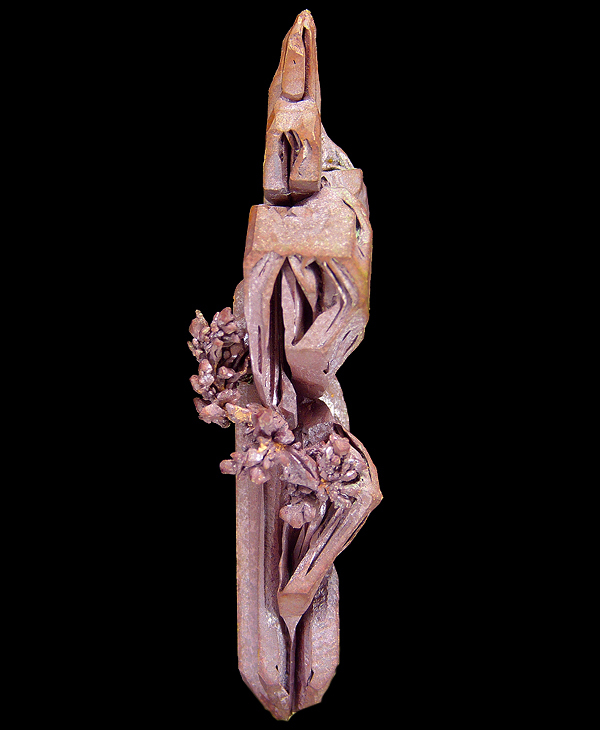 Skeletal, sharp, elongated spinel law twin of copper. Green color is caused by malachite coating, size 4 cm, found in 2015 in Bou N`has mine. Spirifer specimen. M. Wikiera photo. 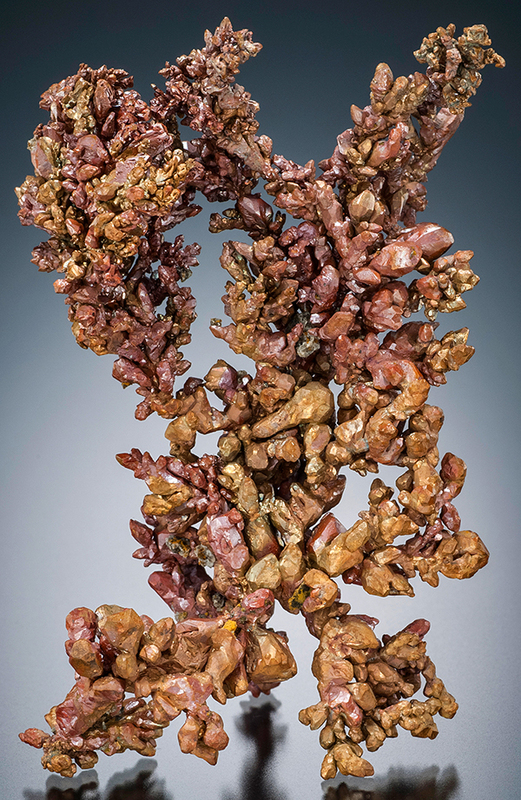 Big specimen of crystalline copper coated partly by mlachite and partly by cuprite, size 10 cm, found in 2015 in Bou N`has mine. Spirifer specimen. J. Praszkier photo. 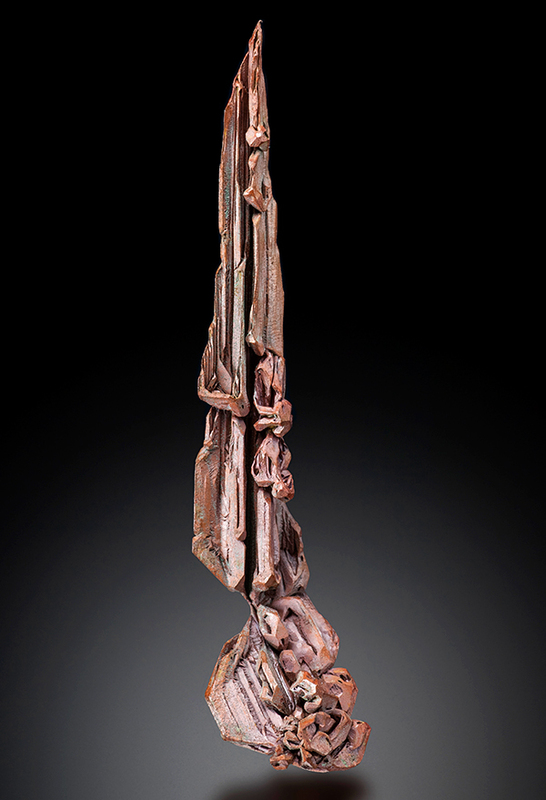 Sharp, skeletal elongated spinel law twin of copper. Red color is caused by cuprite coating, size 2.5 cm, found in 2015 in Bou N`has mine. Spirifer specimen. M. Wikiera photo. Close-up of a fragment of the specimen pictured above. Spirifer specimen. M. Wikiera photo. 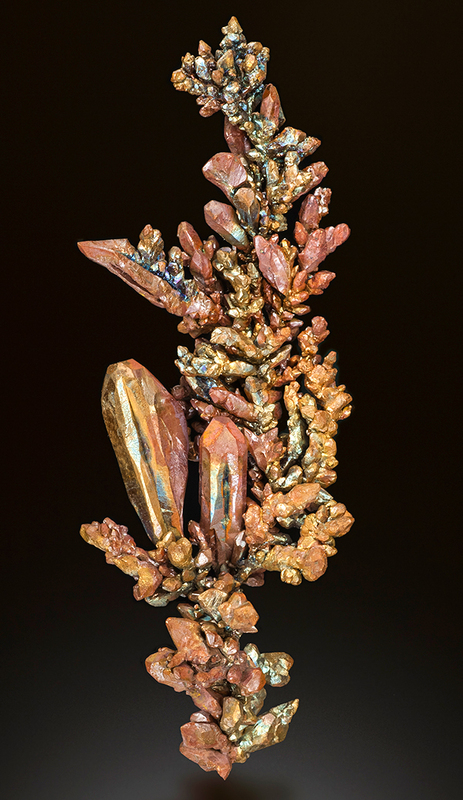 Copper with a prominent elongated skeletal spinel law twin. Red is color caused by cuprite coating, size 3 cm, found in 2015 in Bou N`has mine. Spirifer specimen. J. Scovil photo. Cluster of two skeletal, elongated spinel law twins. Red color is caused by a thin coating of cuprite, size 4.5 cm, found in 2015 in Bou N`has mine. Spirifer specimen. J. Scovil photo. 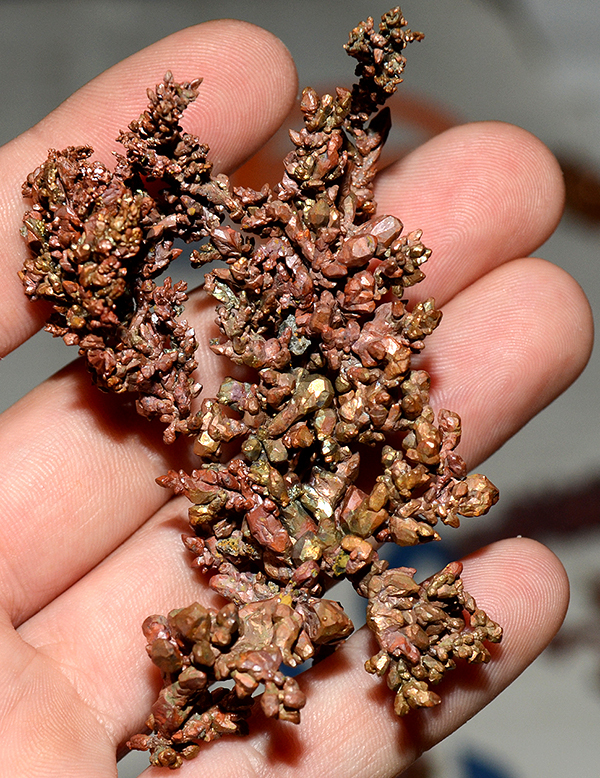 Example of crystalline copper with colorful iridescence caused by a thin film of the Cu and/or Fe oxides, size 3.5 cm, found in 2015 in Bou N`has mine. Spirifer specimen. M. Wikiera photo. Crystalline copper with colorful iridescence caused by a thin film of the Cu and/or Fe oxides, size 3.5 cm, found in 2015 in Bou N`has mine. Spirifer specimen. M. Wikiera photo. Crystalline copper with colorful iridescence caused by a thin film of the Cu and/or Fe oxides, size 4.5 cm, found in 2015 in Bou N`has mine. Spirifer specimen. M. Wikiera photo. 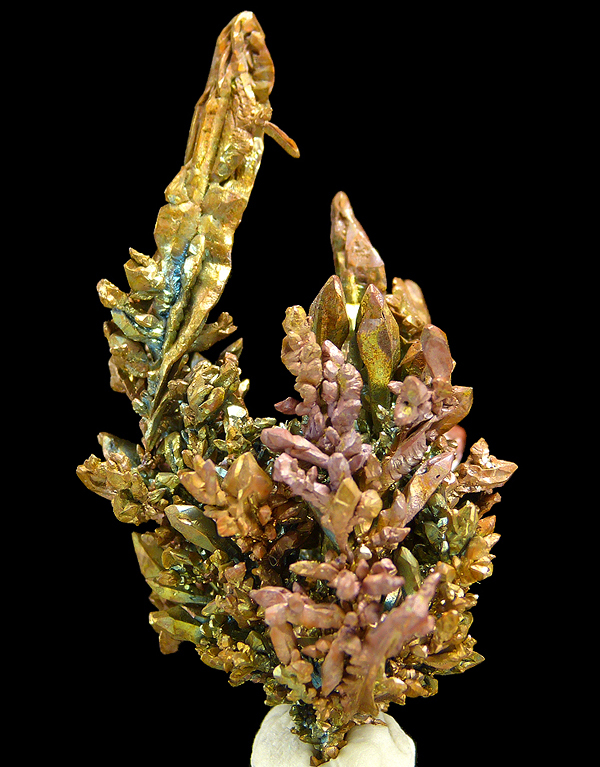 Crystalline copper with colorful iridescence caused by a thin film of the Cu and/or Fe oxides, size 4.5 cm, found in 2015 in Bou N`has mine. Spirifer specimen. J. Scovil photo. One of the best specimens collected from the 2015 pocket, with extreme iridescence (caused by a thin film of the Cu and/or Fe oxides) and beautiful elongated spinel law twins, size 5.5 cm, found in Bou N`has mine. 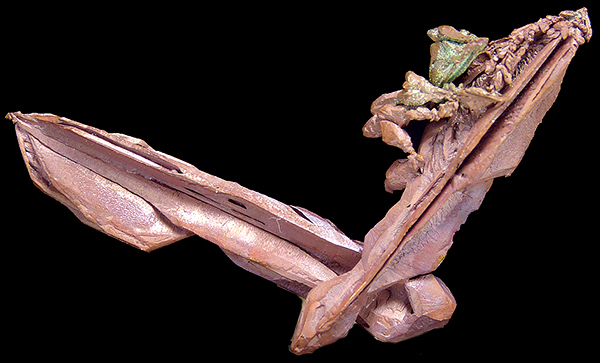 Spirifer specimen. J. Scovil photo.